The Photovolatic and Optoelectronic Device Group is a research group within the sub-department of Condensed Matter Physics, which is part of the Department of Physics at Oxford University. Silicon based photovolatics (PVs) have been remarkably successful and the industry is growing at between 40 to 70% per annum. However, global energy generation from solar power amounts to less than 0.1 % of the total energy used. Conventional PV technology will certainly contribute this century, but to generate a significant fraction of our global power from solar energy, a radically new disruptive technology is required. Our research is primarily focused on developing the physics and technology behind low cost photovoltaic concepts. The materials we use include carbon-based organic semiconductors, solution processable ceramics and inorganic semiconductors which have emerged over the last decade as promising alternatives to expensive inorganic semiconductor technologies. One advantage of this new material family is that they can be processed easily from solution, e.g. using spin-coating, doctor-blade coating and higher speed methods such a Gravure Printing. As a result, devices such as solar cells, light-emitting displays, and transistors should be manufacturable at very low cost. To understand the scale of the solar energy challenge, if we want to generate 10 TWp (current global demand is 15 TWp) in 10 years time with a solar cell which is 10% efficient at converting sun light to electrical energy we need to fabricate PV arrays of 100 km2 a day. This is actually similar to the rate at which we are building tarmac roads. The photovoltaic concepts we currently work on are perovskite and Dye-Sensitized Solar Cells, semiconducting polymer / metal oxide photovoltaics and all polymer photovoltaic diodes. We are also actively developing organic and molecularly sensitized photodetectors and phototransistors and polymer/oxide light emitting diodes. We strive to both enhance absolute performance whilst also improving our understanding of the fundamental processes. The group is located at the Clarendon Laboratory, Parks Road, Oxford, OX1 3PU, UK. Information on how to travel here can be found here. SN Habisreutinger, NK Noel, HJ Snaith et al. T Leijtens, T Giovenzana, SN Habisreutinger et al. I Levine, PK Nayak, JT-W Wang et al. K Galkowski, A Mitioglu, A Miyata et al. J Liu, SK Pathak, N Sakai et al. AD Wright, C Verdi, RL Milot et al. AJ Pearson, GE Eperon, PE Hopkinson et al. Photon recycling in lead iodide perovskite solar cells. LM Pazos-Outón, M Szumilo, R Lamboll et al. G Volonakis, MR Filip, AA Haghighirad et al. MR Filip, S Hillman, AA Haghighirad et al. W Qiu, T Merckx, M Jaysankar et al. A Paulke, SD Stranks, J Kniepert et al. Photo-induced halide redistribution in organic-inorganic perovskite films. DW deQuilettes, W Zhang, VM Burlakov et al. W Li, W Zhang, S Van Reenen et al. N Sakai, S Pathak, H-W Chen et al. C Quarti, E Mosconi, JM Ball et al. J Choi, S Song, MT Hörantner et al. B Roose, KC Godel, S Pathak et al. RJ Sutton, GE Eperon, L Miranda et al. R Zhang, J Fan, X Zhang et al. Synthesis and Investigation of the V-shaped Tröger's Base Derivatives as Hole-transporting Materials. T Braukyla, N Sakai, M Daskeviciene et al. MT Horantner, PK Nayak, S Mukhopadhyay et al. 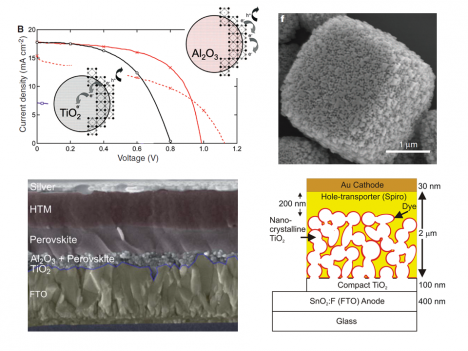 Improving the Long-Term Stability of Perovskite Solar Cells with a Porous Al2O3 Buffer Layer. S Guarnera, A Abate, W Zhang et al. Modeling Anomalous Hysteresis in Perovskite Solar Cells. Optical Description of Mesostructured Organic-Inorganic Halide Perovskite Solar Cells. M Anaya, G Lozano, ME Calvo et al. GE Eperon, D Bryant, J Troughton et al. A Pockett, GE Eperon, T Peltola et al. A Miyata, A Mitioglu, P Plochocka et al. Observation and Mediation of the Presence of Metallic Lead in Organic-Inorganic Perovskite Films. G Sadoughi, DE Starr, E Handick et al. S Pathak, A Sepe, A Sadhanala et al. RL Milot, GE Eperon, HJ Snaith et al. D Moia, T Leijtens, N Noel et al. M Saliba, W Zhang, VM Burlakov et al. C60 as an Efficient n-Type Compact Layer in Perovskite Solar Cells. K Wojciechowski, T Leijtens, S Siprova et al. T Leijtens, ET Hoke, G Grancini et al. T Leijtens, GE Eperon, NK Noel et al. J Beilsten-Edmands, GE Eperon, RD Johnson et al. J Liu, S Pathak, T Leijtens et al. Phosphonic anchoring groups in organic dyes for solid-state solar cells. A Abate, R Pérez-Tejada, K Wojciechowski et al. Highly efficient perovskite solar cells with tunable structural color. W Zhang, M Anaya, G Lozano et al.